A hearty welcome to the servers newest inhabitant. Fungus (who is a very fun guy!) 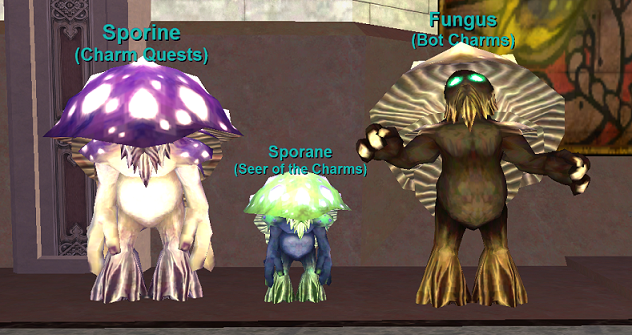 is the newest addition to the Spore Man family. 'Gus offers adventurers the opportunity to obtain a copy of the server's custom charm that can be used for their bots. The new bot charms are available in 5 versions. Vahalla Companion Charm I, II, III, IV, & V.
The stats on each version are still based on each character's charm task completion, however, they are static and do not change with each single task completion like the character charm. Instead Fungus will offer you an upgrade quest as you complete the requirements for each rank. Each charm level is available when you complete ALL of the corresponding rank's tasks. Rank 1 is obtained by completing Tasks 1-10. Rank 2 is obtained by completing all of Rank 1 and Tasks 11-25. Rank 3 is obtained by completing all of Rank 2 and Tasks 26-50. Rank 4 is obtained by completing all of Rank 3 and Tasks 51-75. Rank 5 is obtained by completing all of Rank 4 and Tasks 76-100. In order to facilitate this, the existing charm categories and minimum required level ranges have been adjusted. The charm tasks themselves have not changed. Disclaimer: Each character is limited to only 5 Vahalla Companion Charms, the same as the server's number of active bots restriction. In order to advance your bot charms to the next rank, you will need to surrender all 5 of the previous rank to the quest giver. Fungus is not responsible for lost, stolen, or destroyed charms. Disclaimer: While each new rank is designed to be harder than the previous, the tasks within each rank themselves are in alphabetical order and not in order of difficulty. Not all tasks in each rank are able to be completed at the minimum level for that rank.